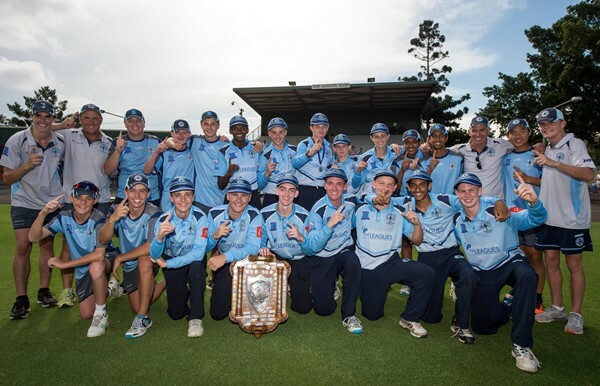 Parramatta remained undefeated to claim the AW Green Shield after defeating Manly-Warringah by four wickets in the Final at Merrylands Oval. The win was Parramatta’s first since 2007/2008 and its sixth overall. Winning the toss and electing to bowl, Parramatta made full use of their home ground advantage as Tyrone Hargreaves struck in the first over of the match. Manly was slow to get out of the blocks, and Hargreaves took full advantage when he grabbed his second in the fifth over to see the visitors slump to 2-2. Manly had their backs against the wall in the tricky early morning conditions. Opening batsman Callum McKay battled to keep the minor premiers at bay until Blair Overton (1-48) dismissed him after facing 48 deliveries for his six runs. Parramatta’s captain Harrison King (2-24) chimed in with a wicket of his own to place his side in the box seat at 4-40. There was no better time for Manly’s Brynn Mendel to produce an inspirational captain’s knock. Mendel scored a vital 59 as part of a 102-run partnership with Aidan Bennett. Mendel was unfortunately run out in the 46th over as the visitors looked to boost their score in the final few overs. Bennett departed soon after for an impressive 40 runs with four boundaries. Hargreaves was called back into the attack late in the innings to finish the job he started in the morning, taking three of the last four wickets to end with figures of 5-25 as Manly-Warringah finished their 50 overs on 9-165. Manly-Warringah needed early wickets if they were to put Parramatta under any pressure. The opening bowling partnership of Jack Hobson (3-26) and Josh Park (2-30) picked up each of the opening batters to send shockwaves through the home side on 2-11. The ever-reliable pairing of Harrison King and Ryan Johns scored freely to get the home side past 100. King and Johns both brought up their third half-centuries of the competition, but in the space of six deliveries, Parramatta lost Johns (50), Abishek Mohanaraj (4), and King (63) to be 5-134. Manly-Warringah piled on the pressure as Hobson claimed their sixth wicket with Parramatta still needing 21 runs to win. Overton (24 not out) and Atticus Burge (6 not out) kept their cool hitting the winning runs in the 37th over to beat Manly-Warringah by four wickets. Tyrone Hargreaves’ five-wicket haul earned him the Kevin Cunningham Medal for the Player of the Final. Parramatta will have one more chance to continue their undefeated run. The premiers will take on the Central Coast in the City-Country State Challenge to be played at Raby 1 on February 18.